Its 2030, the national daily has its top news about energy crisis. The longtime endangered species of crude oil is finally extinct. Though the Arab world still has some reserves left, they are now too costly so as to keep the masses away from using it. Many oil and reserve companies have lost their share value within a week. Some of the Indian gems are on the verge of closure. The situation now is really worthy of panicking. The Indian government is importing limited amount just for research purposes and in a recent move, has banned the commercial use of petrol and diesel to reduce the CAD. Next day, the daily announces-“Here comes the 21st century Buddha with the 21st century petrol.” Featuring a person with a white lungi on the front page, is an article half page long that continues to page 12 publishing a one-and-a-half-page story. The person, named C. Rajsekran has come up to the remedy of the prevalent oil crisis. This time, its a bio-fuel. No cow-dung, but plants. The ‘punnai’ seeds, as it is called in south India produces oil that works equivalent to diesel and thus, not only the crisis gets a solution, India gets the opportunity of becoming independent of energy needs. To be frank, its neither 2030, nor has petrol or diesel got exhausted. But the prices are rising and that too consistently. The burden that the common man faces of oil price rise is already too heavy and seems inevitable. But the good news is that C. Rajsekran lives even today, 16 years before 2030 for real and he could not wait till 2030 to find a remedy to the energy problem. A farmer by profession, C. Rajsekran has got a lot of scientific temperament and hails from Vettaikaran Iruppu village of Kilvelur taluk in Nagapattinam district of Tamil Nadu, India. He is using oil from ‘punnai’ (Tamil name) tree seeds to operate his 5 HP motor pump for irrigating his 5 acres land. Once considered a wasteland, it is now a habitat for 35 different varieties of trees including mango, guava, lime, teak, cashew, amla, tamarind and jack. However, he is more known in the region for propagating the usefulness of punnai seeds. For those unfamiliar with tamil language, punnai tree’s scientific name is Callophyllum inophyllum. The diesel cost incurred during irrigation of land can be considerably cut-down by possessing just two trees, according to Rajsekran. 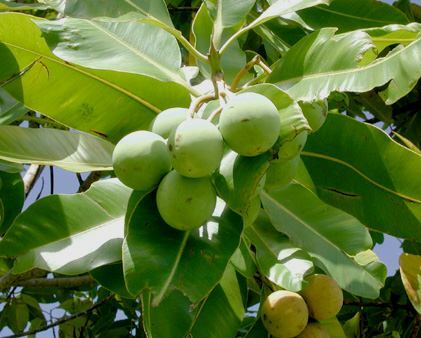 Though the tree grows well in coastal regions, it may grow well in other areas too as cattle or goats do not eat its leaves thus, making it easier for a farmer to grow it. It has the ability of withstanding heavy winds and produces seeds within 5 years after planting. 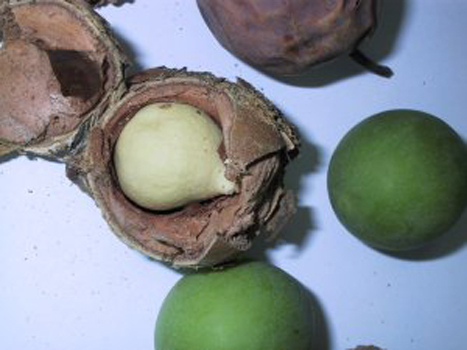 According to Rajsekran, a five year old tree can yield 4-20 kg of seeds a year. 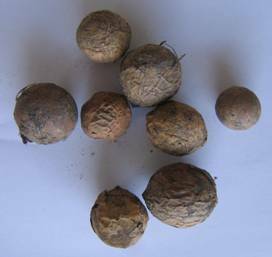 The yield increases to 10-60 kg per year for a 10 year old tree and a 25-year old tree yields 300-500 kg of seeds in a year. An important feature of this tree is that it attracts a lot of honeybees and bats. Naturally, the bees help in pollination and the bats eat the fruits scattering the seeds all over the area through their droppings. From an agriculturist point of view, he might want to try his hands on apiculture. The processing of the seeds include collecting the seeds in the morning and drying them for a week after which they are broken open to expose the kernel. The kernel is further dried for 10 days before oil extraction. One kg of seed kernel gives about 750-800 ml of oil and the cost of producing a litre of oil works out to be about Rs 10. The market value of the oil for other farmers in the region is Rs 42 a litre. But the most important feature of punnai oil, as Rajsekran puts it, is that it is more efficient than diesel. 600 ml of the oil is equivalent to 900 ml of diesel. There is no problem of rust formation in the engine on using this oil as he has been using this for the past 4 years. The smoke produced is also quite less as compared to diesel operated engine. The detailed report is available in the Farmer’s notebook section-“Using Bio Fuel to Run an Irrigation Pump for Five Acres” of the Hindu dated 27th March 2014. So, may be now, we have an answer to our energy crisis and India may actually become energy independent by 2030.